Among the sailors are many islanders from Ryūkyū islands other than Okinawa, as well as carpenters, blacksmiths and others. They serve on the ship as craftsmen as a substitute for tribute payments payable by all the various islands. At the current occasion many of them are from the Kerama Islands district 馬歯山間切, located about 30km to the west of Okinawa Main Island. The islanders from Kerama districts such as Zamami and Tokashiki are all good swimmers. Entering the water, they can keep their bodies from the torso upwards above the waterline [i.e. they swim]. Those persons who climb the masts well are called Aban 亜板, and Kanagusuku 金城 is such a person. Those who excel in their tasks can become promoted to an assistant clerk (Saji 佐事). A person who raises and lowers the anchor is called Dōten 頭掟. Because some of the sailors 水主 must be well versed in the Chinese language, they study Chinese. Sueyoshi 末吉 seems to be proficient in speaking Chinese. The assistant clerk (Saji 佐事) Tedokon 手登根 has the special duty of overseeing the ritual prayers for the deity → Tenpi 天妃. In Ryūkyū itself, Nagamine 長嶺 serves as a Chikudun 筑登之 under → the government of Naha. Within the Satsuma liaison he serves as a subordinate government official. During his current assignment he is employed as a clerk (hissha 筆者) of the ship captain 船頭. He serves in these jobs to support his family. Nagamine belongs to the Hei-clan 平姓 and his name is Seishō 世祥; therefore, his Chinese-style name is Hei Seishō 平世祥. His given name is Tansei 但成; therefore his official name is Nagamine Chikudun Tansei 長嶺筑登之但成. The name of his son in Ryūkyū is Tankyō 但恭. Nagamine has a “Japanese appearance”, i.e. his looks, face, physiognomy, etc. About this, I felt covertly suspicious and, before he returned home to Ryūkyū, I asked him about these and other family details. He told me that he was a descendant of the Taira-clan. He said that a long time ago – at the time of the → Genpei War 源平の合戦 – there was a person who belonged to the Taira-clan 平氏 and who fled to the country of Ryūkyū. And Nagamine is a descendant of this person. Besides the Nagamine family, there are currently numerous family branches [of the Hei-clan 平姓] who gradually branched off from the above-mentioned Taira-clan member. Nagamine writes in the calligraphy style of the → Oie-sama 御家様 and is good in Japanese writing and poetry. On one occasion Nagamine also went to Beijing and he can speak Chinese. Well, Nagamine left his mother of over 70-year-old in the country of Ryūkyū. He had hired on the ship to provide and care for his old mother. But now he is concerned if his old mother is concerned about him because the ship drifted away and things did not happen as expected, and he also shed some tears. 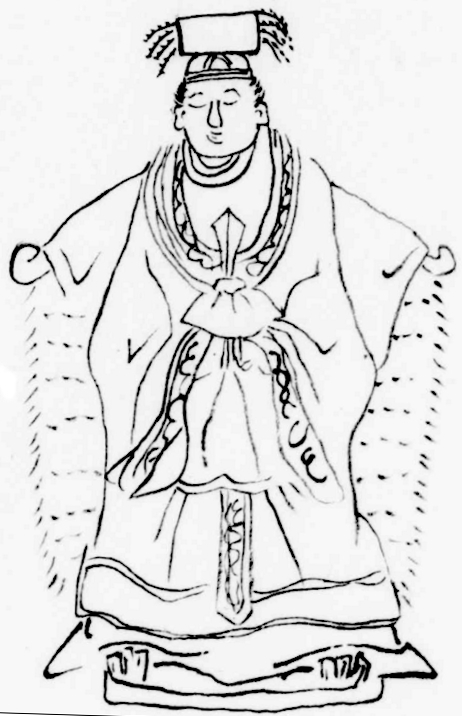 Depiction of Tenpi (Mazu) from the Ōshima Hikki, Kōchi Prefectural Library. Note on assistant clerk Tedokon and Tenpi 天妃: Tenpi is the Chinese guardian deity and patron goddess of seafarers and safe maritime travels. It is also known as Mazu 媽祖. Referred to as the “Mazu Culture” by scholars, over centuries it spread centered in Fujian Province and the southeastern coast of mainland China. It had a significant impact on Chinese and East Asian coastal culture, including Ryūkyū, Japan and Southeast Asia. In Ryūkyū, two Tenpigū 天妃宮 shrines are dedicated to this goddess. They were built during the years of the Yongle Emperor (1403–24), so they have a long history. Originally, before the establishment of the Meirindō in 1718, the two Tenpigū shrines in Okinawa were used as educational facilities by Kume teachers. Furthermore, on Ryūkyūan ships, statues and images of Mazu were enshrined. Therefore, Tedokon’s duty were rituals or prayers for the sea goddess Mazu. This might have taken place on the ship itself, but also before and after safe return at the Tenpigū shrine in Okinawa. Note on the government of Naha 那覇官: It is called the “government of Naha” here, but might more specifically refer to the Mono-bugyō and/or the Naha Satonushi. Note on the Genpei War 源平の合戦: The Genpei War was a conflict between the Taira and Minamoto clans during the late-Heian period of Japan. It resulted in the fall of the Taira clan and the establishment of the Kamakura shogunate under Minamoto Yoritomo in 1192. This eyewittness acount by Tobe Yoshihiro is very interesting in connnection with the legend of Minamoto Tametomo, who is said to have come to Ryūkyū and his son becoming the first king Shunten. This tale was included in the official Ryūkyūan history called Chūzan Seikan, written by minister Shō Shōken (Haneji Chōken). It is considered a concession to Satsuma which retrospectively justified the historical claims of Satsuma over Ryūkyū. Note on Oie-sama 御家様: This refers to the school of calligraphy called Son’en-ryū 尊円流. This school of calligraphy was created by Son’en-hō Shin-ō 尊円法親王 (1298–1356), the 6th son of Emperor Fushimi (伏見天皇, 1265–1317) and the 17th head priest of the Shōren-in temple in Kyōto. The style is also referred to as Shōren-in-ryū 青蓮院流, Oie-ryū 御家流, and Awata-ryū 粟田流. While it might appear a negligible bit of data, this Son’en-ryū was the official calligraphy style in Ryūkyū. In fact, the recruitment tests for the Yuhitsu 右筆 or amanuensis had to be written in exactly this style of calligraphy. In other words, persons like Itosu Ankō, who was a Yuhitsu 右筆, more likely than not knew and used this writing style. Acknowledgement: Many thanks to Motobu Naoki Sensei for his full and benevolent support in clariyfing various difficult issues in the translation of various terminology and historical backgrounds. This entry was posted in Ōshima Hikki. Bookmark the permalink.